L-R: Sherman Howard, Stacy Ross, and Susi Damilano. Photo by Carol Rosegg. BOTTOM LINE: The little-known, yet influential modernist painter gets his story told through an imagined love triangle played out on stage. Commissioned and directed by San Francisco Playhouse artistic director Bill English, Bauer is an imagined final meeting between Bauer (Sherman Howard), his wife Louise (Susi Damilano), and his ex-lover Hilla von Rebay (Stacy Ross). Rebay was also an artist, a curator, a lover and colleague of Guggenheim's, and was pivotal in the creation of The Guggenheim Foundation and museum. Gunderson's play centers on one afternoon/evening manipulated by Louise Bauer to bring Rebay and her husband together one last time in hopes of rekindling an artistic passion in a broken artist. Although Guggenheim and Rebay bailed Bauer out of a German gestapo, they also both played a role in creating a contract that destroyed Bauer’s freedoms as an artist. Bauer, misled by a contract written in English rather than his native German, unwittingly signed away all of his past and future works to Guggenheim for a monthly stipend. Gunderson’s play spends the majority of the time catching us all up to speed on these details and more. The dialogue is crafted in such a way as to divulge all of the information to the audience while still allowing her characters to fight for something in the moment on stage. Bill English’s direction is polished, yet static at times. His staging is meticulous, but it leaves the actors little breathing room. The set he and scenic designer Ewa Musynska have created is aptly that of a blank canvas of a room. Micah J. Stieglitz’ projections transform the white walls into a vibrant display of color whenever inspiration strikes Bauer. This is aided by superb lighting design by Mary Louise Geiger. Projections are a useful tool English employs because it gives the audience an opportunity to see Bauer’s work projected and add context to his artistic struggles. Nevertheless, as good as Stieglitz’ projections are they can’t help but lack the texture of a true painting. This is why the use of the convention as the climax of the play falls short. Upon exiting the show ushers hand out one of the best “party favors” I’ve ever received after a play with a little book on Bauer’s life and paintings. This provided a more detailed retrospective of Bauer’s career. Of course, you could also check out current exhibitions at Sotheby’s and the German Consulate General in New York and gather even more appreciation before attending. As Rudolf Bauer, veteran-actor Howard is given the challenge of educating the audience on an overlooked passionate artist in a play stationed at the end of his life when he is embittered, disgruntled, and uninspired. He admirably shows flashes of both sides of Bauer, but for the most part he is bogged down as a bit of the curmudgeon that Gunderson paints of him. In a film biography of Bauer we’d perhaps have the flashbacks to a younger vibrant Bauer who is making seas of changes artistically and politically. Without those insights we’re left only with a man turned unpleasant by wrongdoing. We believe he was electric at one point in his life only by the fervent performances of Ross and Damilano as the two women who are trying to resuscitate a genius they both love. 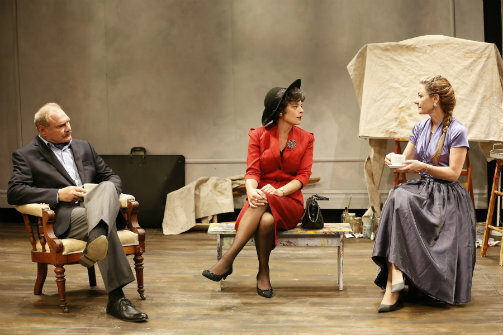 The chemistry of this love triangle fizzles under the information-heavy dialogue, even though the play does succeed in inspiring you to give Bauer’s life and work a serious look.